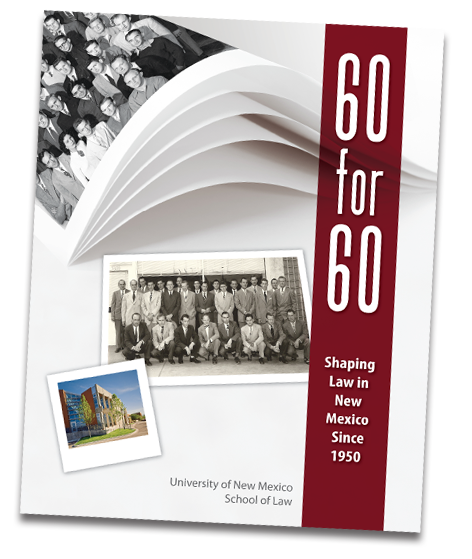 The 60 for 60 book contains a lively sampling of 60 people, contributions and things that have shaped law in New Mexico and the School of Law since 1950, when the school’s first graduates headed out into the legal profession. The book can be purchased for $24.95. A special limited edition of 60 for 60 can be purchased for $100. This exclusive volume contains signatures of the deans and favorite professors for a special keepsake. If you are interested in purchasing a copy of the book please contact alumni@law.unm.edu. Books can be shipped for an additional shipping cost of $10 per book. In June 1950, the University of New Mexico School of Law graduated its first class. To commemorate the 60th anniversary of this momentous event in New Mexico history, the School of Law launched the 60 for 60 Project. The project began with a comprehensive call for nominations of people, changes, events, legislative breakthroughs, transformational changes and accomplishments related to law in New Mexico and the School of Law. Following numerous nominations, and an exhaustive review process spanning four months, the project's Chairs and Advisory Committee members developed the book's content by selecting a diverse sampling of entries, sidebars, photos and content comprised of individuals, programs, cases and achievements that have played a critical role in improving or furthering legal education or the legal profession in NM since 1950. While it would be impossible to include every achievement connected to law in New Mexico and the School of Law over the last 60 years, it is our hope that you will find this book to be a light-hearted, enjoyable collection of some of the people, organizations and events which have created transformational or significant breakthroughs, improvements or impacts in law. The School of Law community has a very important legacy in New Mexico. The 60 for 60 Book and the 60 for 60 Celebration will honor this legacy.